Reality is love creating story. This is true of quantum particles playing out their dance and true of the universal macrocosm playing out its dance of stars, black holes, and galaxies spinning through space. It is true of our own multi-dimensional selves. We are all aspects of love creating story. In group is found the wholeness of that story. The wholeness of our story requires perspective to see and understand it. This is like painting, each painting looks like a discrete separate form. Yet the arc of all the paintings I have ever created are one continuous process. So a failed painting is not a failure. It is a moment of recognition of how the process works and that knowledge is revealed in the subsequent paintings. So it is with the story of humanity. It may look a mess, just as paintings look terrible at certain stages of development, and it may not achieve its immediate aims, just like an individual painting may appear to fail. It is always a matter of perspective. If one painting is all there is, the failure of it is a calamity. But if the perspective is of a continuum of the process of painting, a failed painting is simply part of the larger process. So it goes with humanity. But we have difficulty finding the perspective to see that when we are deeply enmeshed in this immediate experience on the planet. 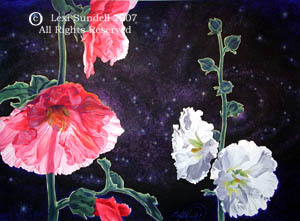 This entry was posted in Art Thoughts and tagged continuous creation, creating, failed paintings, love, perspective, reality, story on April 17, 2012 by Lexi Sundell.